School will be out for many families this month, and though vacations and good times begin, it's important to keep striving to prepare our families for emergencies. 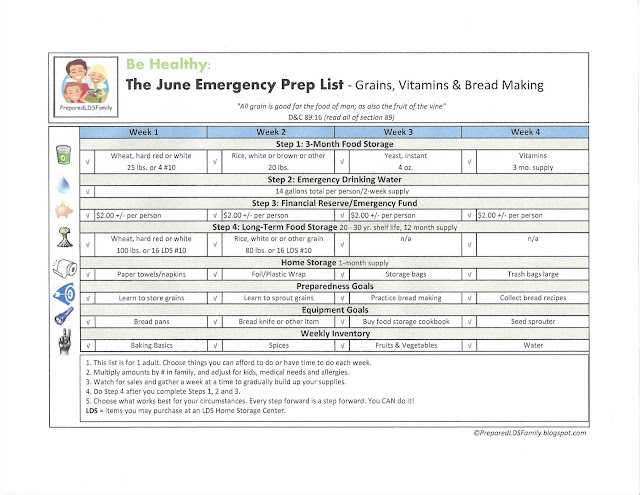 June is the month I like to focus on gathering wheat, rice, yeast and vitamins for my family into our food storage. Even though it is hot, I'll have more time to practice bread making skills and teach my youngest. This is also a good time to gather paper supplies like paper towels or napkins, foil, plastic wrap, storage bags and trash bags. Check out my list below to see if it has something that will help you. Many grains can be stored long-term (20 - 30 years), but some cannot (check link) because of the natural oils. For example, it's fine to put brown rice in your 3-month food storage supply of everyday foods, but brown rice does not store well long-term because of its natural oils. White rice is better for long-term storage. Grains are inexpensive, which is wonderful. Even though long-term food storage is the fourth step in the LDS Four-Step Approach to Home Storage, I like to gather them year-round because you can store a little at a time and build up your supply. On my monthly list for June, I suggest amounts to gather for each adult. A great show which teaches you how to use grains, is Fusion Grain Cooking on BYUtv. You will want to check out Chef Brad and watch some of his shows online if you don't have BYUtv. Oh! And here is a food storage video I made for my Relief Society a few years ago that may help you understand the four-step approach to home storage I always talk about. A few years ago, I had a dream that was a wake up call for me regarding emergency preparedness. Suffice it to say that it involved an earthquake and many people not heeding the counsel to become better prepared. I remember being concerned for their safety and trying to get their attention. When I woke, I immediately wrote the details of the dream. I've never done that with any dream before. Most dreams are inspiration for the person who dreams them, and this one was for me. I'm not a disaster forecaster and I'm not predicting "the Big One," but in this dream, I remember warning people, and being ignored. They were distracted with the internet, computer games, thrills, and things that matter least. We can either choose to be like the Children of Israel in the days of Moses and wait for a sign, or we can be guided by the Spirit and the counsel of living prophets today to become better prepared now. The choice is ours. I hope we will each work harder to gather some supplies to help our loved ones and our neighbors. I hope we will take the time to make sure we have stored an adequate supply of water and other necessary supplies. I feel peace knowing my family is storing a little bit at a time and not panicking and going into debt to do it. If you think you can, you will! Just move up that hill an inch at a time. that which yieldeth fruit, whether in the ground or above the ground." Red or White Hard Wheat? Which should I put in my food storage? Wheat Storage: How Long Can I Store Wheat Flour? 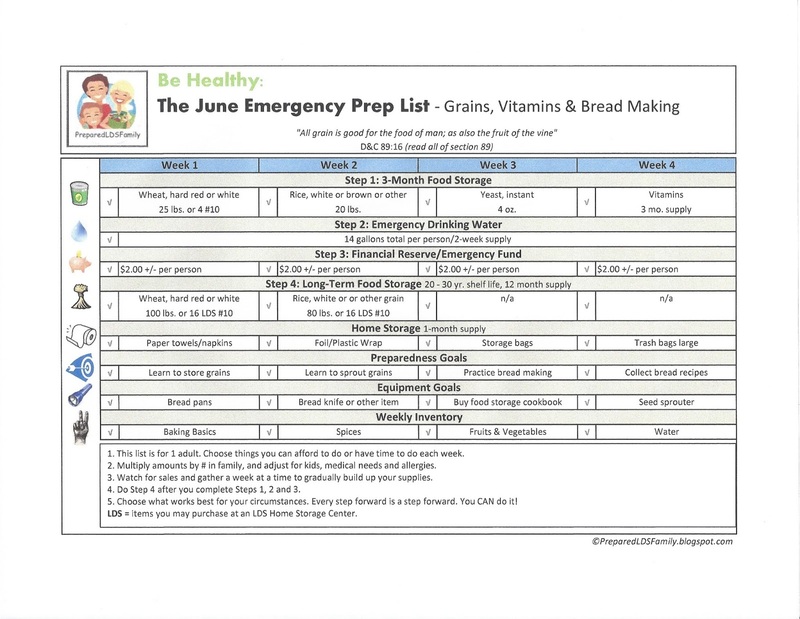 Food Storage Essentials: Storing grains: What about carbs and gluten intolerance? Right now, we are watching another super tornado headed into the Oklahoma area. (We have family there.) I hope your pain gets better, that is really a painful condition. Thanks, Gayle. I appreciate you! I want to echo Gayle's message a bit. I am also not LDS, but I am a spiritual person. I have been feeling led to prepare since about 2000, but it seems to grow more in intensity each year. I feel we are being prepared for something, I just don't know what. I really love that you have stressed that we are all God's children, and that we can lengthen our reach and put some things aside for others. I also prefer smaller containers of water. Along with individual bottles of water in cases, I also put water in Arizona Tea gallon jugs we rinse out and fill with water with just a bit of bleach in them. I also have water in jugs that I didn't bother to put bleach in, because they can be used to flush the toilet for a couple of weeks (for example). My storage is somewhat small. In fact, it probably would only feed us for about a month in its current state. I add to it slowly as I am able in these tight economic times. I am working to learn how to become a better gardener so that I can hopefully grow more of our own food for canning and storage....not to mention to be a bit more self sufficient in case of difficult times. Thank you for all that you do. You ARE getting through to someone. I don't read every single entry, but when I have time I do like to glance through and get some ideas and inspiration. We would not be led to prepare if we were not expected to be able to survive whatever might be in our path. I take some solace in this as I continue to learn whatever I can in my free time as I am able. Bless you and all that you do! Thank you Me from Maine. Love knowing I have reach someone. Feeling much better. Would you be willing to share your dream with some folks via email? I'm curious, I'm always intrigued when folks have experiences like that. I think for now I will leave it to what I shared already. I think it gave me encouragement to not give up on this site. And to just help those who are wanting to learn. I don't know it all, but feel confident that Heavenly Father has something for me to do. Even if you only help one person, that person goes on to help many others. Our influence is exponential in its sphere. Don't stop helping others. You may never know how many people you will save. I just want to respond to Me from Maine... you may have "only" a month of food but you are ahead of 90% of the general population! Don't be discouraged. The fact that you are focused on preparing and are moving forward in your efforts is a Big Deal. Good job! First, I am not LDS, and I know that you are not concerned with only reaching out to the LDS community. I appreciate all you do to help us. I am a firm believer that in times of emergency we need to be there to support eachother. I, too, have been having dreams for the past 2-3 years, and have felt the Spirit pushing me, urging me, to prepare. Not coming from the Mormon background, and living in NH, there are not a lot of recourses available, so when I found your blog and another called Everyday Food Storage, I was relieved! My husband and I, through a great deal of prayer, have reprioritized our lifestyle so that we could build our food storage, and now we are working on gardening for a sustainable lifestyle. Each step we take, I feel more and more peace seep into my heart. Thank you! Thank you for making these steps small and not overwhelming! Thanks, Marcy! So happy you are moving forward! 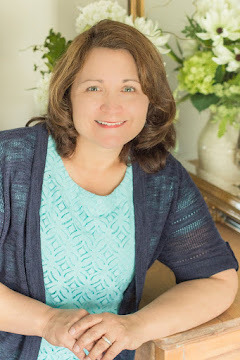 I am LDS and really appreciate your blog! Thank you for this post, thank you for sharing your knowledge, insight, and promptings! I emailed you the other day. I hope you are feeling better! Your blog has been very important to me for several years now. I have you posted on my blog. I am not an LDS either but believe preparation gives a peace of mind to living plus critical to whatever comes. Your blog has certainly been a boost to me. I would encourage your to move forward as you can. In 2011 I had 2 major surgeries and your blog was part of my daily read. I enjoyed reading through the wealth of material you have. It kept me feeling I was not alone in these ideas. Take care of yourself at this time and heal! Thinking of you! FYI I've been exercising in the neighborhood pool and it has done wonders. I will post about it sometime. Like a few others here who have commented before me, I am not LDS, but am a Christian and started researching preparedness a couple of years ago. I need to say a huge thankyou to you as I read your blogs and 'try' to follow your monthly lists, you have helped me understand so much. We don't have anything quite like you guys do over here in Australia...no one really teaches us anything about getting prepared. We don't have a lot and I am not anywhere as prepared as I would like to be, but we are moving in the right direction :) Thanks again for all your effort and pray that your healing would be swift. I've been following you for a couple of years and I'm glad to see your post today. I've really missed your posting more regularly. I've recently had a disturbing dream, not a big disaster, but more of an invasion and a non-Christian faith overrunning my city. I am leary of sharing too many details....it could just be a dream, but it could be a portent of things to come. Best to do what I can to be ready. I have always appreciated that you prepare with stuff from the grocery store, not just freeze dried stuff I can't afford. Hope to see more from you soon. Thanks, Katy. I'll be writing on my blog more often. :-) I don't focus on my dream, as much as the prompting to move forward with what I was supposed to be doing anyway. Yep, gather what you can afford over time, and don't panic. Thank you for sharing. I appreciate it.